Australia Islands Visit the Whitsunday Islands, one of 160 paradise islands, part of one of the Seven Wonders of the World: the Great Barrier Reaf. A group of over 160 paradise islands dotted amongst azure waters will greet you - with a front-row view of one of the Seven Wonders of the World: the Great Barrier Reef. To experience one of the most beautiful places in Australia, perhaps the world, you must visit the Whitsunday Islands in Queensland, Australia. A group of over 160 paradise islands dotted amongst azure waters will greet you - with a front-row view of one of the Seven Wonders of the World: the Great Barrier Reef. The islands can be discovered in countless ways - on day trips, fishing trips, diving trips, camping trips, helicopter rides and more. There is a limitless choice of vessels to take you on the trip of a lifetime and all offer similar activities, with the same fantastic breathtaking views. The gateway to the Whitsundays is the charming town of Airlie Beach, which seemed ever alive with happy travellers reuniting with their fellow sailors. The view I was greeted with as my coach pulled into this little settlement was awe-inspiring and one which I will never forget. It was the bluest water I've ever seen. 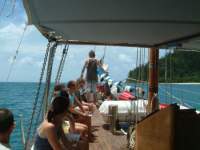 I explored these islands in the best possible way, in my opinion, which was on a sleep-aboard boat for 3 days/2 nights. I was onboard the Summertime boat, run by Aussie Adventure Sailing, who have many boats of different types to choose from. We met the group we would be sailing with on the jetty early on the first day and were taken onto our boat and introduced to each other and the crew. 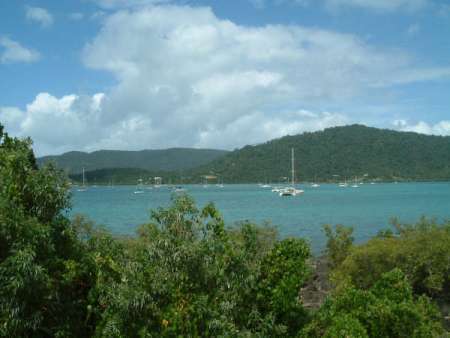 We soon set off on our trip, out into the blue waters. My first experience of the Whitsundays was sailing along in the sunshine, watching the green islands go past, with the wind blowing and not a care in the world. This was a trip to remember. To witness some of the most plentiful marine life in the world, then the Great Barrier Reef is a perfect place to start. We sailed (on some choppy waters at times!) to the spots which the crew thought were best for undersea life, and then were given instructions and snorkeling equipment and taken off on a speedboat to see what we could find. And it was so much more than I expected. From the moment I put my face under the surface I entered a whole new world, with every fish I could imagine. 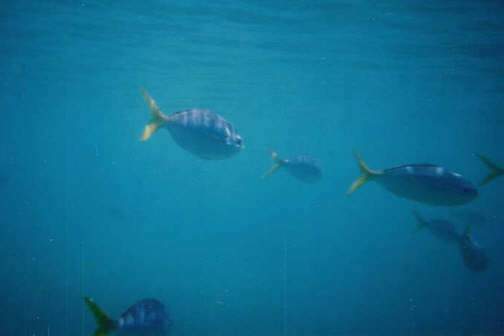 Sea anemones, rainbow fish, catfish, shoals of bright blue and yellow angel fish – they even swam up to my face if I floated still in the water – and I could follow a shoal as if they had accepted me as part of their group. Snorkeling and diving was a wonderful experience. The world under the water’s surface is surreal, I felt transported into a quiet, colourful and breathtaking world where everything was different. I learnt to dive for the first time, despite being extremely apprehensive. Although it cost extra to try diving, it was worth every penny to experience life under the sea and the unique experience of seeing the water level so high up above me, hearing nothing but the swoosh of my breathing and the bubbling sound of air escaping upwards. We had to learn all the hand-signals and safety measures before we went down. It was the perfect place to try diving as we could wade in from the shore and get deeper gradually, rather than jumping straight off a boat. And I was told (by a fellow passenger whose career involves diving all over the world) that it was the best place to learn, with some of the most abundant fish and marine life in the world, and the clearest water. There is one downside to snorkeling in the stinger season (October to May), namely a Stinger Suit – the unflattering but necessary 'Cat Woman' suit I had to don in order to venture into the jellyfishes’ world. After all, we weren’t really meant to be in the sea, so we can’t expect them to keep out of our way. The Box jellyfish and the tiny Irukandji jellyfish that reside in this area can both be very dangerous, so we didn’t want to take any risks. Thankfully no one on our boat got a bite - probably thanks to our suits! As we carried on throughout the trip, we visited some magnificent beaches. Classed as the whitest beach in the world, Whitehaven Beach is the stuff of dreams. With incredible views and the softest, whitest sand and the clearest bluest water, with sting rays swimming gracefully alongside, you could easily be mistaken for thinking you’d died and gone to heaven. We were able to swim a long way out from the shore in shallow water and relax in the gently rolling waves. We even spotted a turtle swimming near to us, which was an extraordinary experience. Our boat trip included kayaking, on two-person rafts/boats that were like canoes, and we were sent off on adventures around various bays. After mastering the technique, this is a fun and energetic way of exploring the islands, but we had to watch out not to get caught on the rocks! There were caves to explore onshore, and a wealth of creatures lurked in the bush – we came across the world’s second biggest spider, the Golden Orb, which had spun a giant web right next to the track. Not stuff for the faint hearted! After a hard day’s snorkeling and bush walking, we were able to unwind and relax in the onboard hot tub with a glass of wine (or two) that we had purchased onshore before we left. And then we waited for the night show of stars, of which thousands could be seen, filling the sky with a magical glow. 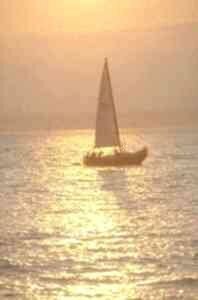 The only other lights were from other boats, and the only sound was gently lapping water. The rocking motion of the boat acted like a cradle, and sent us all into a deep sleep when we retired to the cosy cabins below deck. As if it couldn't get any better, our taste-buds were given a treat during the trip – at times I felt I was eating-out at a top restaurant! We were served amazing food, all freshly cooked on board by the resident chef. There was a fantastic array of fresh fish and meat, vegetables, salads, along with mid afternoon snacks, and nibbles. To top it all, we were indulged with cooked breakfasts - whilst the sun was rising over the jungle-covered islands surrounding the boat, and the water was just beginning to shimmer. We started mornings by jumping off the end of the boat for a refreshing wake up ‘bath’. Nothing can get better than that. And there wasn’t a moment went by that we weren’t being entertained by one of the Aussie stories; how they love to tell a tall tale! We were spun yarns about infamous creatures such as Drop Bears, Hoop Snakes, and undersea monsters, as well as being convinced we were having barbequed kangaroo/crocodile for dinner (when it was just steak!). And we sat open-mouthed and wide-eyed until we came to the realisation that somehow they couldn't be true!The trip was made that bit more special by having such amusing hosts. One downside to the trip, however, is that we were not allowed to have showers on board for more than 2 minutes each per day. This was a little difficult as we were feeling the effects of the salty water and the sun, but we all managed to put up with it and it was small price to pay for what we experienced. But the relief at being able to have a long shower when we got back on shore was felt by all (a major topic of conversation at the after party!). Our experiences on the trip brought us together as a group and we met some great people from all walks of life and all parts of the globe. I would go again in an instant and highly recommend the experience to anyone. 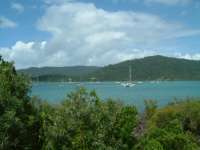 Trips and adventures from Airlie Beach. The official Queensland Holidays website. Covers Airlie Beach. If you enjoyed reading the above article then you will probably also enjoy Samoa, also in Australasia, and our latest articles covering the Orinoco Delta, La Mata, Marbella and Beijing.